Chevron sold this tract in the City of Bellaire. 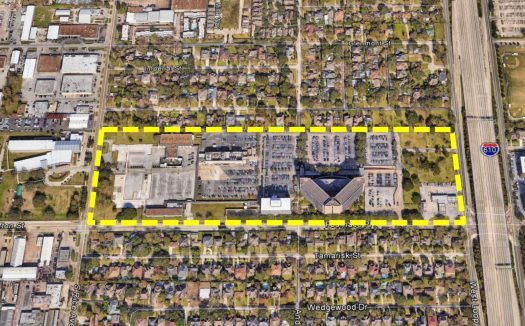 BELLAIRE – (Realty News Report) – SLS Properties, a Houston firm led by Danny Sheena, has acquired the 30-5-acre Chevron campus at Loop 610 at Fournace Place in Bellaire. Chevron vacated the property. The Chevron site includes two vacant office buildings, a 10-story, 452,000-SF office tower and a 95,000-SF structure. SLS plans to construct a four-level parking garage and lease the buildings as multi-tenant space. HFF’s Jeff Hollinden, Wally Reid and Davis Adams marketed the property, which less than two miles south of the Galleria. The site has some Loop 610 frontage although the hard corner is a gas station and property under separate ownership. Being located in Bellaire, which has zoning and more controlled development, tamps down the potential for developing the property.